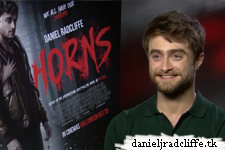 A few days left and Horns will be in cinemas in the UK (29th October). Here are some press junket interviews recorded in London. There's one video from Sunrise in Australia and you can find MTV UK's interview on Facebook. He also talks about visiting the Star Wars Episode VII set. I will add more below if they appear online. There's also comingsoon.it: Halloween video and second one. Update: 29th October 2014. Do you remember the tweet about Daniel being BuzzFeed UK's Agony Uncle? Below you find the video. Then there's also a video from Radio Times. And thanks to them for the news about another great video. Update: 8th November 2014. NME magazine (full video below) & Times Now. Update: 22nd November 2014. Yahoo Screen video added. Update: 19th February 2015. Another Sugarscape video added.